Soup makes for a festive party hors d'oeuvre when served in a small vessel. I serve this wild mushroom soup in an espresso cup with a dollop of creme fraiche so that it looks like a frothy cappuccino. It's something a little different than the usual canape and tastes great. Note that this recipe only makes enough for fourteen espresso cups, so if you plan on serving it in soup cups, be sure to double the recipe. In a Dutch oven over medium heat , melt the butter. Add the onion, garlic, and bay leaf. Cook until the onions are translucent, about 10 minutes. Add the mushrooms and cook until tender and any moisture has evaporated. Stir in the flour, salt, and pepper and cook 2 to 3 minutes. Add the vegetable broth and bring to a low boil. Reduce the heat to a simmer, cover, and cook 20 minutes. Stir in the cream and cook an additional 10 minutes, stirring often. 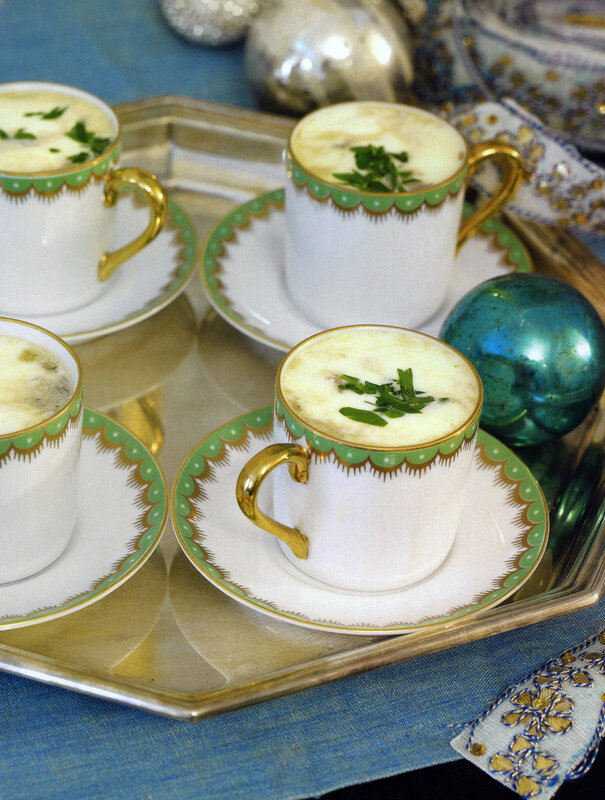 Serve in espresso cups garnished creme fraiche and parsley.